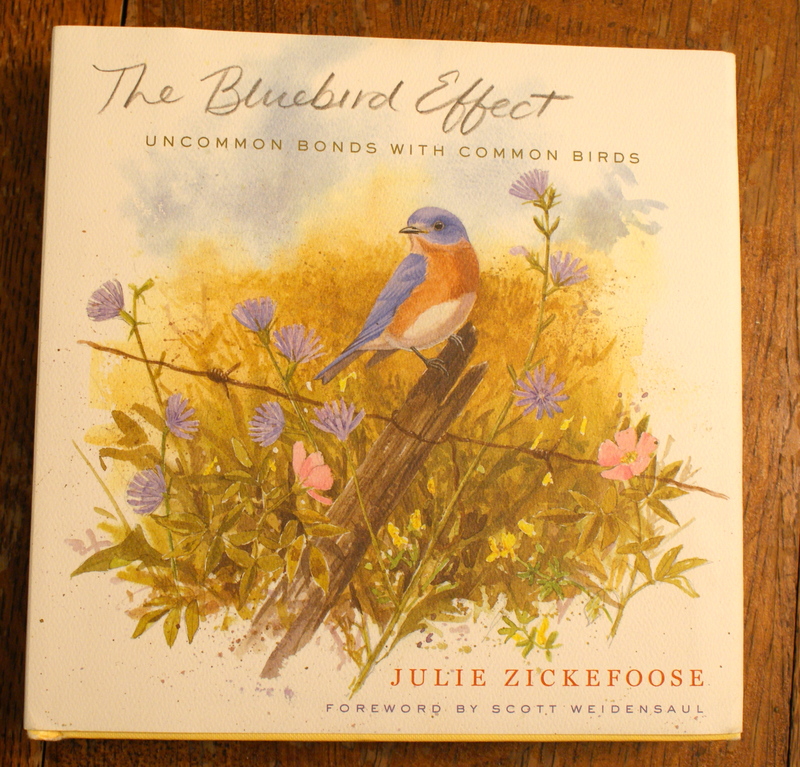 I was recently approached by the publisher Houghton Mifflin Harcourt to review a new book by Julie Zickefoose – The Bluebird Effect: Uncommon Bonds with Common Birds. When we opened the package, we all gasped at the beauty of the illustrations. The first thing that struck me was the heft of the book – the cover is thick and solid, the pages are substantial, glossy, and feel so satisfying in the hand. This is a book for people who enjoy the experience of reading an actual paper edition, who get something out of the physical presence of the book. The Bluebird Effect is dense in words, but Julie’s stories are so interesting I found it hard to pull myself away. She includes stories about 25 of the many birds that have come into her life. She has been a wildlife rehabilitator for many years, taking in birds that have been injured or orphaned, and trying to nurse them back to independence. She lives with her family on an 80-acre sanctuary in Ohio; the’ve added a 42-foot tall bird watching tower to the property. This allows her to come into contact with a wide variety of birds and other creatures. 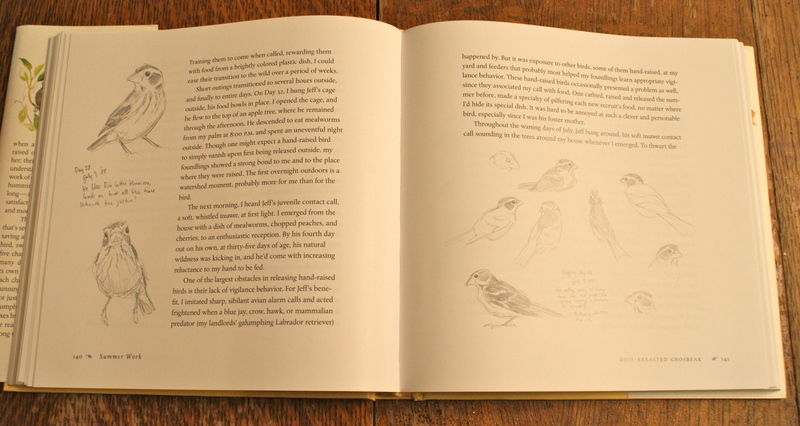 Zickefoose’s sketches and paintings illuminate every page, and she manages to show the personalities and unique attributes of each species. She says, “Learning about birds is, for me, like piecing together a puzzle that lasts a lifetime.” (Page 206) For example, she learns about how quickly each baby grows feathers, the differences between species in speed of growth and development, and when babies fledge. She even discovers new facts about some birds that scientists didn’t know. When you spend so much time with birds in all life phases, you are really able to get a peek into the mysteries of their lives. I learned so much from reading this book. I think my favorite quote is the following: “I don’t look like an ornithologist; I look more like a mom, who, binoculars, always at the ready, dashes between window, kitchen sink, washing machine, and computer.” I am nowhere near the artist or scientist that Julie is, but I have totally been in this position – balancing the duties of motherhood and housework with the pull of the natural world outside the windows. Mothers, children, and all nature lovers will really enjoy this book. I started reading this to the kids; it’s a bit advanced for Annika, but Gabriel is really enjoying the stories of birds and the paintings and sketches. I sent Julie Zickefoose some questions by email, and here they are with her answers. I really hope you enjoy this interview! The Hiker Mama: I’ve worked my way through your lovely book and really enjoyed it. How inspiring! My kids even have been enjoying flipping through the pages, admiring the artwork, and having the stories read to them. In the introduction to your book you write a little about how you came to have the interesting life you do. Would you tell my readers something about what led you down the path of illustrator, writer, and bird rehabilitator? What aspects of your childhood encouraged you along this path? Julie Zickefoose: I always had an enormous empathy for animals, having been raised by an Iowa farm boy who, by the way, could spin a good story and did–endlessly. My sister, two years elder, and I always drew for recreation, drew and read. So very early I learned to appreciate animals, the process of drawing, and the art of storytelling via my dad, who was also a good writer. When I’d find an injured or orphaned bird, a tolerant mom and helpful dad would help me figure out how best to care for it. I had plenty of opportunities to play bird doctor: our next door neighbors had about a dozen free-roaming cats that devastated our neighborhood birds. I eventually convinced her to spay and neuter them all, and keep them indoors–a major coup for an eight-year-old! Perhaps seeing me tenderly caring for the birds they injured helped. HM: How did you learn to be such a good artist? Do you have any tips for kids who want to do realistic wildlife art? Do you have any resources for learning to draw and paint that you would recommend? JZ: I am a huge believer in going to the library and checking out stacks of how-to books on art. “How to Paint Landscapes in Watercolor.” That kind of thing. My best tip for kids who want to do realistic wildlife art is to draw from a living animal whenever the opportunity presents itself. A sleeping dog or cat is an ideal place to start. Petting zoos, farms and zoos are great places to draw. In my view there is far too much simple copying of photographs going on. It’s so very important to learn to draw from a three-dimensional figure. HM: How do you draw birds, which move so quickly? Do you draw and paint from photos? Real life? In the field? JZ: All three. The quick, slightly rough sketches you will see in The Bluebird Effect were all done from life. Many of the paintings used a combination of resources, but I think that the liveliest work is done with the bird right in front of you. To draw a moving bird, you must draw quickly, and be content with capturing bits of action and attitude as you go. You can always fill in the details later. HM: What do you recommend for kids who want to have close encounters with birds? JZ: Nature centers and zoos, farms and duckponds, feeders and bird baths all have myriad subjects from which to draw. Get some binoculars–decent ones, and listen for bird songs. Track birds down by hearing their songs and learn their songs by following the sound until you see the singing bird. 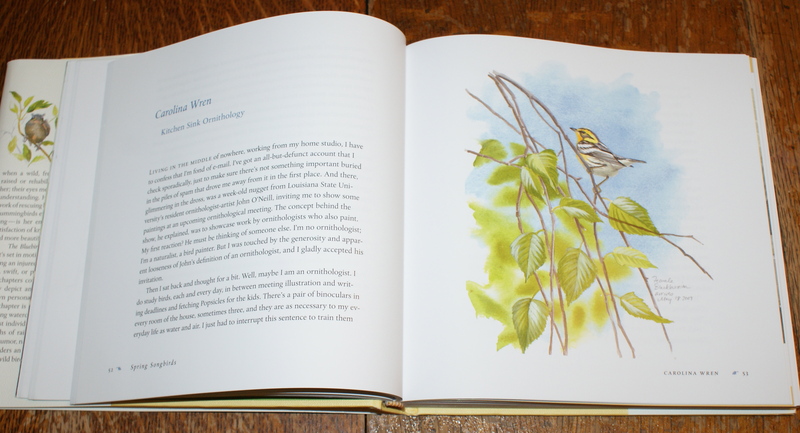 Look it up in a field guide (my husband Bill Thompson III just published The Young Birder’s Guide to North American Birds (Houghton Mifflin Harcourt). It’s an excellent, stimulating book I highly recommend. Would even if I didn’t have 200 drawings in it. HM: My 6-year-old daughter wants to be a “wildlife rescuer” when she grows up. What kind of training and education does one need to be a wildlife rehabilitator? HM: Is the work you do rehabilitating birds volunteer? Do you get reimbursed for your out-of-pocket expenses, such as bird food or the special homes you build for them? JZ: It’s all out of my pocket, and on the contrary, I actually have to pay the state of Ohio $50/year for the honor of answering my phone all day long in the summer, helping people out of wildlife emergencies. HM: How many captive birds do you have in your home at one time? JZ: I travel far too much now to be very active in rehabilitation. You have to have a couple of months to rub together to raise baby birds, and thanks to speaking engagements and intensive work at bird festivals around the country, leading field trips and speaking and playing music with my husband, I no longer have that kind of unbroken time. I’d have to be taking them along on jets! The bulk of my work, that I write about in the book, took place in the 80’s and 90’s, up until about 2000, when my kids were small and I was home all the time anyway. I do take a ton of phone calls and can almost always help people quite a bit with advice and referrals. That said, I usually raise one or two birds a year, and have any number of transient injured birds and box turtles around at any one time. It varies. HM: Are your children involved in caring for birds, too? Do they follow in your passions? JZ: Both my kids are very caring and tender, and are of great utility in helping me raise birds. I wouldn’t say that either of them is bird obsessed; my daughter, 16, loves baseball most of all, and my son, 12, is a wonderful artist. Both of them run cross country and track. They appreciate living deep in the country and are always telling me about the things they see when they’re out. They’re very lucky kids, and they get to go with us to several birding and nature festivals each year, to places like North Dakota, South Texas, Maine, and West Virginia. HM: Anything else you’d like to share with parents about getting their kids out into nature? JZ: Yes. Here attached is an essay that says it far better than I can in an email. It’s called “Asking More of Kids” and it was written for Bird Watcher’s Digest in March, 2009, and you have my permission to excerpt it. And thanks for taking the time to read my book and interview me! Thanks so much for taking the time to answer my questions amidst your busy schedule. Visit Julie on her website at http://www.juliezickefoose.com/index.php. You can follow along with her fascinating blog at http://juliezickefoose.blogspot.com/. And finally the legal disclaimer: I received this book free from the publisher, but all opinions in this review are my own. The first couple of years out here in the woods I thought it was a bear nearby until I realized one day that the sound was coming from the sky. Once I realized it was the bird, I started calling it the bear bird. Once it flew overhead close enough for me to see that it had a patch of white on the underside of each wing. It’s mostly black or some dark color and its wings come to a fine point and almost has the shape of a seagull when flying in the air. It’s perhaps a little smaller than a crow. This year, there seem to be a few extra flying overhead. The one near our house often chases others away. I have no idea how to figure out what kind of bird this is. I don’t even know where to begin. Perhaps I need to take that next step and look into getting a good book. Thanks for the book review. Love your work. Katie, I have a few thoughts. Does this bird come out at dusk and dawn? If so, it could be the common nighthawk http://birdweb.org/birdweb/bird/common_nighthawk Click on that link and it will take you to a web page – you can find all kinds of info about the bird, including the noises it makes. It’s a grew website for northwest birds. I definitely recommend picking up a field guide or three. You might start with a field guide meant for youth. Audubon has a good one, and there is a new one out that I will be doing a review on soon called The Young Birder’s Guide to Birds of North America by Bill Thompson III that I really like for many reasons. http://www.houghtonmifflinbooks.com/hmh/site/hmhbooks/bookdetails?isbn=9780547440217 When you are ready for more complete bird books, we have two standbys – the classic Peterson Field Guide to Birds of Western North America is one I’ve used for years. And now there are two newer books, both by David Allen Sibley – The Sibley Field Guide to Birds of Western North America and the Sibley Guide to Bird Life and Bird Behavior. http://www.sibleyguides.com/about/ THese will cost you a bit more money, but have more detailed information you can’t find in the other books. THere are also many apps for smart phones for those who are into digital resources. In the interview with Julie Zickefoose, she recommends having a field guide in hand, a pair of binoculars, and going outside and tracking down what you can find. Learning about birds is an activity where you build one piece of knowledge onto another, block after block. Join a local Audubon Society and get out on some field trips with the experts. Keep good notes and keep track of what you see. Birding is great for homeschooling, too – you can weave a lot of science and other topics into it. Thank you so much for this wonderful opportunity, and for reading (and loving) The Bluebird Effect! I so appreciate the attention you’re drawing to the book. The links to my husband’s book are much appreciated too. You’ve already got Katie’s bird figured out–could only be a common nighthawk. She’s hearing the BEERMP!! it yells as it circles. And the “bear growl” sound–I liken it the sound of “jake brakes” on a rapidly decelerating truck–is produced at the low point of a steep dive, when the nighthawk pulls itself up out of the dive and the wind vibrates its wing and tail feathers. It’s a breeding display, but is also a territorial display that, oddly enough, is sometimes directed at HUMANS as we stand transfixed below the displaying bird. Terrific description you’ve given, Katie. Get yourself some binoculars and a Young Birder’s Guide and get going! Thanks again, Hiker Mama! Apologies for taking so long to respond, but THANK YOU SO MUCH for helping me identify my “bear-bird!” Hearing its “growl” is so much more fulfilling now!